Thanks to reader Heather for these questions. 1) What is the soil/sand ratio for most terrariums? You have mentioned two different ratios so I want to be sure. In most you say it's 2:1 soil to sand. However, in the "Operation Diagnose" area (the most recent one on your pages) you say 1:1. 2) Is Miracle Gro's basic potting soil ok to use? One of the ingredients is peat moss and I know you warned against it in Operation Diagnose. However, I know some plants do well in it; I used it with the last terrarium (first I've made), and it did ok until I killed it with spray fertilizer after about a year. I hope you can help me - I am making a 10 gal terrarium for work (bio labs) and want to do it right. As your terrarium is on the larger size I think a ratio of 2 parts soil to 1 part sand will work best. 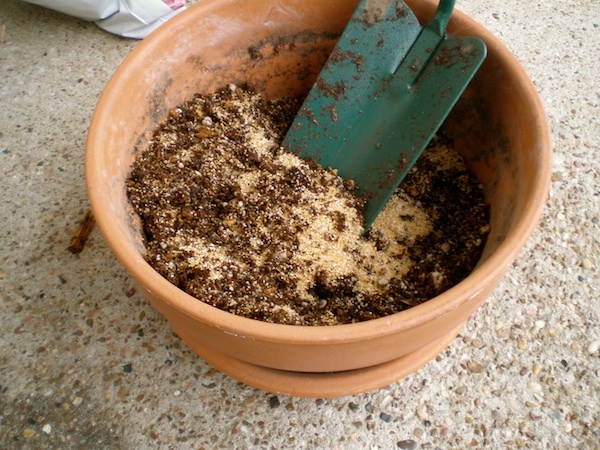 The sand speeds up drainage in smaller terrariums but since you are working with a larger quantity of "stuff" (and probably larger plants), 2 parts soil will probably provide more nutrients for a longer amount of time. Potting soil mix should work fine. The peat moss retains moisture - which works great for a potted plant that might not get watered as frequently but can contribute to problems in smaller terrariums. As long as you have the one part sand in there it should all balance out. I'd also stress to build a large drainage level with pebbles and charcoal. I'd make it at least an inch deep or more in a 10 gal terrarium- it'll help give water space to "breathe" at the bottom of your contained environment and should prevent root rot from standing water, etc.